Most of the oldest surviving art in the world is made of stone. 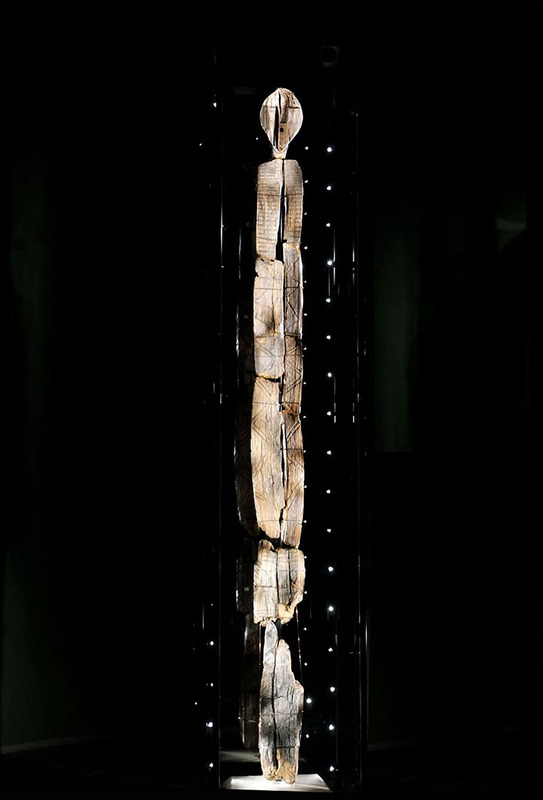 But scientists now believe that the Shigir Idol, a huge, enigmatic wooden sculpture found in a peat bog in Russia in 1890, is twice as old as the pyramids at Giza. The Idol, which once stood about 15 feet tall, depicts a man with many faces and an elaborate pattern of carved lines. The sculpture was carbon-dated in 1997 and determined to be about 9,500 years old. However, many scientists disputed the findings, so curators at the Sverdlovsk Museum decided to submit samples for re-testing. A lab in Germany conducted tests using Accelerated Mass Spectrometry on seven tiny wooden samples. The results indicated the idol was in fact about 11,000 years old, from the early Holocene epoch. It was carved from a larch tree using stone tools. This entry was posted in The Art of Science and tagged Ancient art, ancient wooden sculpture, science art, Shigir Idol. Bookmark the permalink.